I have only myself to blame, it was the little voices in my head that said “you don’t want to miss the chance” that got me talking to Jon and Dave. I hatched a plan to finish a long outstanding project and have a go at the mass build then on to something bigger and this would do nicely. Okay that fits with the plan for a build late in 2019 and of course I could wait for the engine to become available, no rush is there. 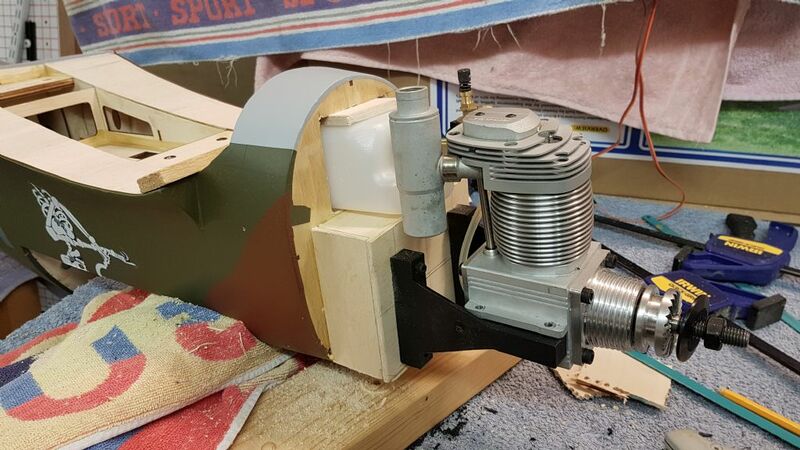 My dilemma was only compounded by a visit to Inwoods (Dave) who pointed out that they were producing a 3D printed pilot and instrument panel and that another batch of kits were due in soon. Then a chat with Jon about engine availability highlighted that there were some due for completion, no pressure then just buy it and put it on the shelf. But of course it would be a waste of Jon’s time just to buy it and store it, perhaps if I bought the kit as well, yes that seems logical. Having the kit on the bench just invited me to have a look inside and check everything is there. Now with the countdown to the MB, there is only one thing to do…clear the bench. Oh why did I leave it on the bench in the first place, well the best thing would be to assemble it and anyway there isn’t enough room under the bench. As an ARTF most of the assembly is straightforward so I’ll post the odd photo showing progress. Don’t forget to chip in with any advice or tips as I get into the “assembly/modification” of the model. + the electrics for it (Thanks to George at 4-Max for suitable advice). Looks like wings and servos next. Very nice project, I will watch this with interest. Good choice for the engine.My DB Hurricane taught me that if you can see the elevator move then you have too much movement! Really light on elevator but a great flying aircraft. Thanks for the info Chris and yes I had picked up on other Hurricane posts plus chat with Jon just how elevator travel and position can give the pilot a very high workload to say the least! He mentioned that one of the SG Hurricane traits is pitch response to different throttle/airspeed that is not unheard of with other warbirds and best if the pilot knows/lives with it rather than being surprised, so another thing to bear in mind. Centre wing flaps fitted, then outer wings flaps and ailerons/flaps. First bit of rework became apparent once the wings were slotted together as the connecting rod miss aligns. It gest worse as I followed Seagulls pre marked holes for hinge alignment (that don't !). Minor work around and then on to the U/C install. Just a bit of faff and possibly some additional holes that don't need to ne there. I'll hide them under the existing hinges and learn the lesson to fit the wings together first, then set the hinge line. My DB Hurricane taught me that if you can see the elevator move then you have too much movement! Really light on elevator but a great flying aircraft. This line of detail should be in the instructions for every warbird kit on the face of the earth. I am very sure that a significant number of models are lost due to excessive rates combined with a shed load of expo. This is why so many people complain models are tail heavy and add half a ton of ballast. In reality the model was probably balanced fine but the rates were just too high. My usual procedure is to take the recommended low from the instructions and halve it. I then use the low rate as high and we are off to the races. In the case of the seagull i think we got down to about 6mm? It wasnt my model so i dont remember exactly. I just kept turning the rates down until it was nice to fly, i didnt measure anything at the time. Hi I found the flap connecting rod slot just needed widening in a horizontal plane . That is simply due to wing curvature. As the flap is deployed the rod needs to move horizontally. Horizontal widening doesn’t impede the function. Regarding elevator rates I think better control can be obtained from using the second servo arm hole (assuming you are using (standard Servo arm )in order limit total travel . 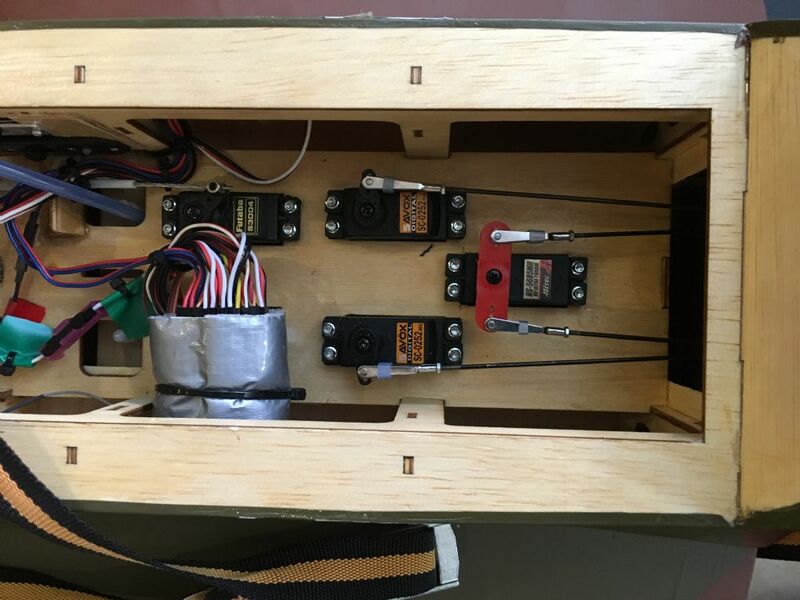 (Please see photo below showing the two elevator servos with clevises in second slot). On my Hurricane I initially made the mistake of leaving the servo in the third slot and just reducing rates. The engine cooling is quite sufficient as there is a gap at the bottom rear of the cowl and wing . Opening out the exhaust stack exits also ads some hot air extraction. Have you cut the hole in the wing to fit the tank yet ? Thanks guys, I think I have noted most of the mods, but its good to cover them here in case anyone else is looking through. CF3, I picked up somewhere that the full size ones failed their trials on poor spin recovery! Hawker request the test be excluded and the MOD sent it off to another facility where the problem was resolved (fairing near the tail wheel and root of the fin - I think) but not before the first 100 were in service...perhaps not so good being an early adopter! 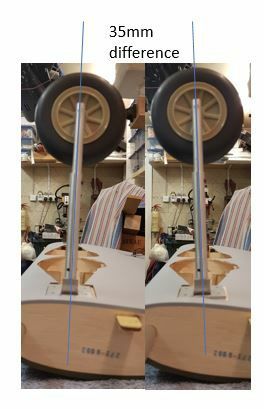 What does the tail wheel connect to (the manual shows an arm, but the control rod does not appear in your photo? When you cut the hole for the tank, did you mark and cut front to back? Manual states 140mm people seem to agree that 130 is better.......but on another forum the guy states manual 130mm and he set it to 120mm + reports no major dramas with flight performance. I don't mind measuring up and posting where wing tubes etc are for a more informed discussion or I'll just aim for 130mm as a max. I have seen the full size aircraft deploy flaps to what looks like 90 degrees which seems to suggest that they are intending to achieve maximum drag and not much lift, please correct as its only my assumption. I have no experience of split flaps being deployed to that angle as I went for a lot less with the mossie all be it they are not split flaps and in reality it seems to fly quite slowly with no flaps (been using the long runway, might be a different story on the short!). I was initially thinking 3 positions, with up, 20 degrees and ...err something else but 90 degrees seems a bit all or nothing! 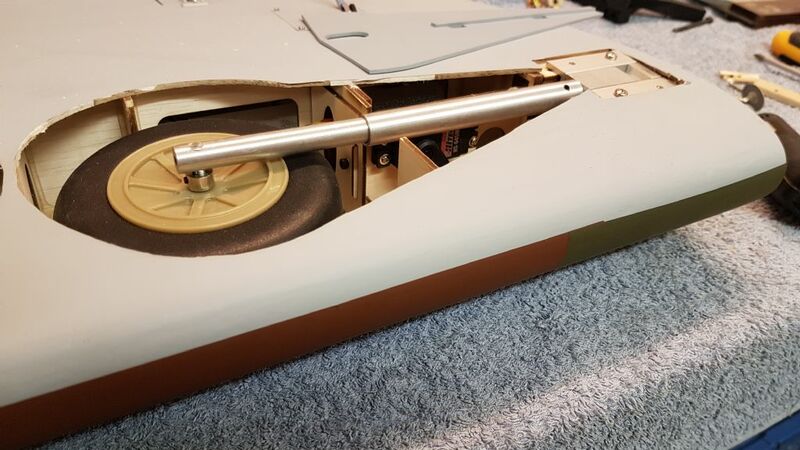 The tail wheel connects via an arm and rod to the rudder servo . 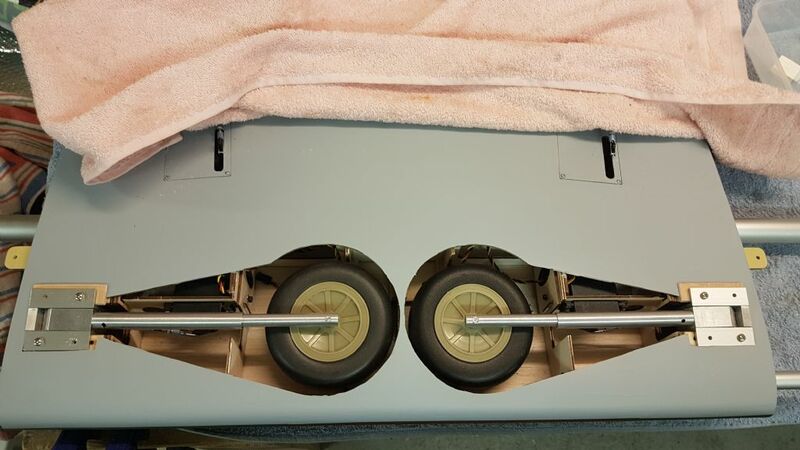 Rudder isn’t pull/pull on this plane it’s rod. 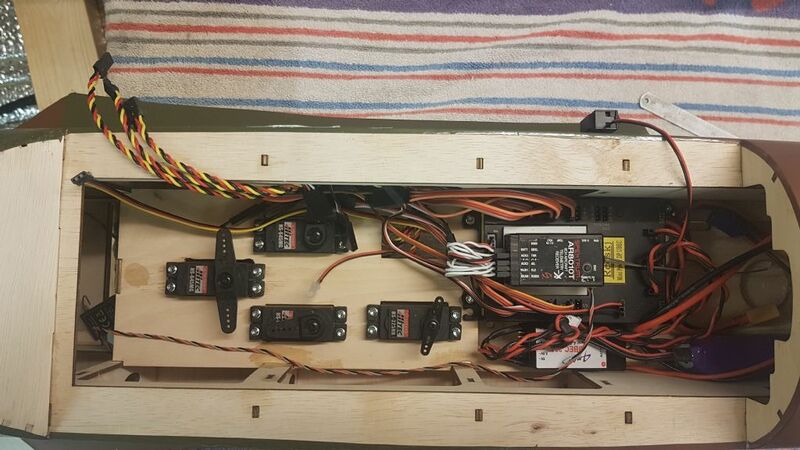 In photo you will see my hi-tech rudder servo has two clevises on it . On of them is for tail wheel pushrod. The tail wheel aluminium solid bar is very heavy and I drilled mine out a bit as I also thought the tail wheel too heavy! It could have certainly been lighter. To save tail weight you could substitute aluminium tube? The split kit aluminium bar is also a bit long and spring a bit fierce! For wing tank slot I did first mark and cut front to back and made balsa frame then epoxy/glassed it a bit . Regards c of g I think mine is close to the manual but will need to double check. I Anything near 90 deg on flaps is really shoving the brakes on . I have now set mine to 45 max degrees as per my other planes . I use side sliders on my Futaba TX for flaps so they are proportional and can be totally adjusted then can experiment. Most of the guys complaining the model is tail heavy probably have massive rates and assume the pitch sensitivity is down to c/g when its not. If you pile the beef in the front you end up with a model that wont taxi without standing on its nose. I have seen this many times with the YT models i have. Every forum post had people moaning about the c/g being wrong and yet i found them to be just fine. I would balance at the recommended marks. Do it gear up, empty tank and slightly favour nose heavy. The gear swing forward when down and cause a significant nose drop. The other thing to remember is that you are going to burn 12oz of weight out of the fuel tank while the model is flying. Most of the time we never notice the effect of this so dont get hysterical about a few oz here and there. For flaps i use probably 60 degrees on my sea fury and then drive it home with a steep approach and lots of power. My La7 is the same. On my P39 is use much less and find the model floats on too much so i am increasing it slowly. Having lots of flap is really handy as you can do a steep approach without touching the elevator at all. Just use the power to change the decent rate. This is very handy as it means you cannot stall it as you arent tugging the elevator all the time. Anyway once you get to 4-5 ft up you GENTLY squeeze in some elevator to level off and add a little power. By now you should be at 6-8 inches and totally level. Kill the throttle and the model will immediately start to slow down and will drop onto the runway due to all the drag. Once down add power to maintain rudder control and thats about it. I recommend to do 'wheeler' landings to begin with as attempts to 3 point could end up with a balloon and stall. Work up to 3 pointers slowly if you bother doing them at all. 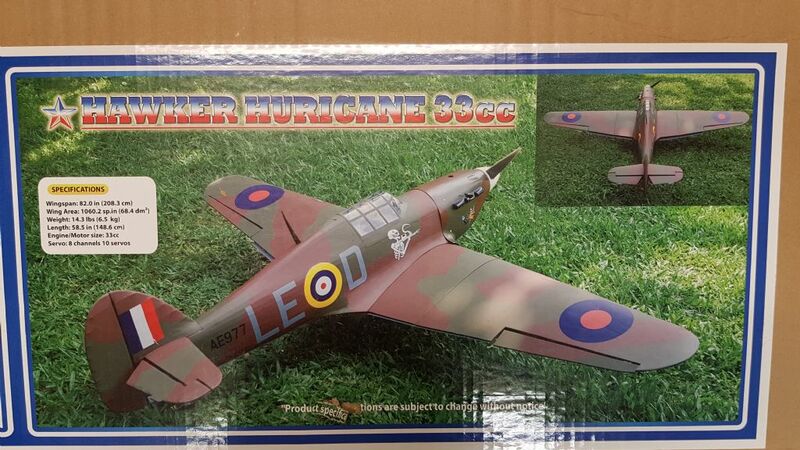 At least the Hurricane had selectable flap positions - model a Spitfire properly and it's a maximum deflection or nothing! I love the story told about the Spitfires sent for the defence of Malta which needed take-off flap to get off the carrier safely. The engineers came up with an ingenious solution - wooden wedges to hold the flaps slightly down against the pneumatic pressure which dropped out after cycling the flaps once safely airborne! Not a lot of progress last night, but then again the weather forecast this weekend there must be some workshop time possible. Until I tried the wheel covers and then noticed that they don't sit flush. I like the idea of the last option as it will look right although its more work, I'll remove the packing and just see how much its changed things. Any other ideas before I commit? How close are the oleos to the surface of the wing? if they are really close you can just use little pipe clamps. More progress although limited due to a visit to my LMS (Inwoods). Lots of jolly banter with Dave regarding the length of servo leads and modelling in general. 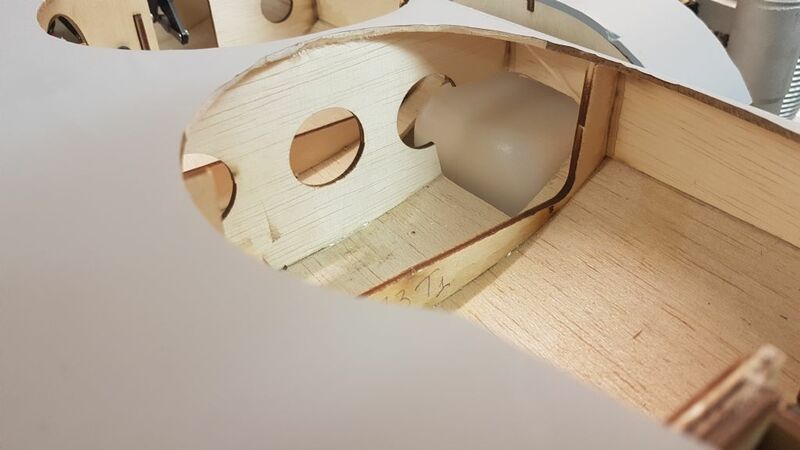 Dave pointed out that the front U/C mount could be trimmed and on closer inspection is a a piece of packing ply on top of the main interlocking parts. Once home a little trimming and removing the packing plates I had made and I have 3 mm cant on the U/C. Its not as much as I had with my packing piece, but the wheel covers now only protrude by 5mm at the wheel end. I'll take Dave's advice and try it like this and pack the back up if its still an issue although Time and Jon's comments indicate the 3 mm mod is sufficient. What can I say regarding progress but for a rainy day all be it a couple of quick ventures into the great outside to do chores and breath of fresh air. Fitted engine and tank thanks to Tim's photos all went well.